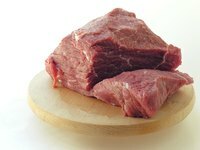 Beef tips are the end pieces of sirloin and tenderloin cuts of meat. They are often the leftovers from when the butcher cuts down larger fillets. Beef tips cooked in a light gravy and served over pasta or rice is a popular comfort food in the United States. Making beef tips in a pressure cooker can cut down on cooking by about 20 minutes, as the pressure cooker allows the liquid in the beef tip sauce to boil at a higher temperature than a skillet would. Place 1/2 cup of flour in a large mixing bowl. Add salt and pepper at your discretion. Toss in beef tips and coat them thoroughly in the flour. Put the onions, broth and Worcestershire sauce into the pressure cooker. Stir in the flour-coated beef tips. Place the lid on the pressure cooker and turn on your burner. Allow the pressure cooker to get up to medium pressure, then cook for 20 minutes. Remove from heat and allow the pressure to subside before opening the pressure cooker. Prepare a paste of water and three tablespoons of flour, then add it to the beef tips mixture. What Kind of Beef Is Best Canned?